First, I wanted to make sure the car held up—and that Tesla stayed in business—and that the car met my expectations over an extended period of time. Second, I wanted time to really understand all its positives and negatives before writing about it. And finally, posting this requires admitting that we spent a lot of money—way more money than we would have ever thought we’d spend—on a car. I’m not one of the YouTube generation who seem to enjoy publicly sharing their expensive purchases, so this is uncomfortable for me to do. However, I think the interest level in the car and company is high, so I wanted to share my now multi-year real-world experiences. What follows is a very long (with the emphasis on both “very” and “long”) multi-part writeup that’s probably of interest only to those intrigued by electric cars, or to those contemplating buying a Tesla—not necessarily just the Model S, but also the (even costlier) Model X or the (getting closer to reasonable) Model 3, or the coming-in-2020 Model Y. Even in multi-part form, these are not short posts. For those who don’t like long blog posts, you best stop reading now…and here’s a tl;dr if you do decide to stop here: I love our Model S (though it’s not perfect), I’ve grown to love electric cars in general, I believe our automotive future will be primarily electric, and I now find it annoying to drive dead-dinosaur-powered cars. Tesla’s Model S web pages do a great job at explaining the car and all of its features, so I’m not going to rehash all of those here. 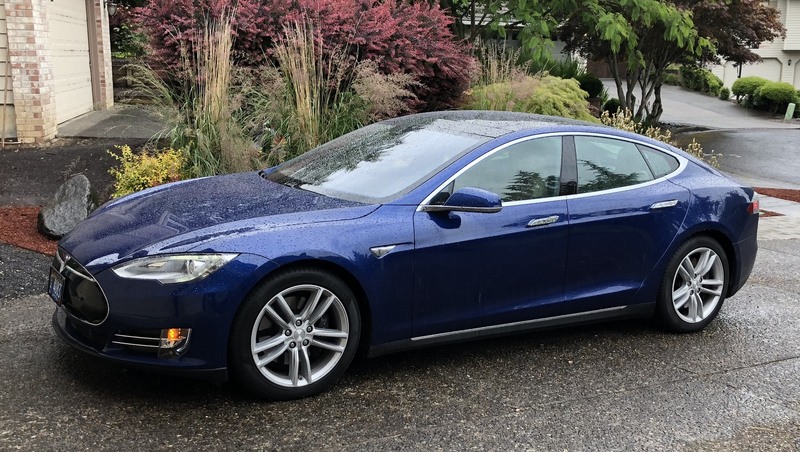 Many of those features and capabilities factored into our decision to buy the Model S, but the main deciding factor was that the Model S was the car that best matched what I wanted in a vehicle. Over the years, I’ve tried many brands and cars—too many, my wife would probably add—but I’d never found one that met all of my criteria. If it was fun to drive, it was too small for the family. If it got great mileage, it accelerated like someone running in molasses. If it had room for the family and all our stuff, it wasn’t any fun to drive and probably looked like an SUV. During my ride in my friend’s car, it was hard to miss the good acceleration, the smooth ride, the neat tech features inside, and the level cornering attitude. From that point on, I was intrigued. But it was really expensive, and at the time, the Model S was brand new and the car and the company’s future was uncertain. So we waited. My first reaction when I hit the go pedal was pretty much “holy cow!” There’s no throttle response lag, no waiting for RPMs to rise, no clunking of gears engaging…just a powerful stream of torque from the moment you depress that pedal. Stopping is nearly as eye-opening: I only use the brakes in the Model S for the final few feet of any stop. All the rest of my slowing down is via regenerative braking—release the go pedal, and the electric motors reverse, which slows the wheels and acts as a generator to charge the batteries. While the Model S doesn’t have “full stop” regenerative braking, what’s there is amazingly effective: Without fail, anyone who’s driven my car has stopped short—no, not that stopping short!—at the first few intersections they’ve come to, letting off the go pedal way too early. The Model S is not a small car—it’s only about eight inches shorter than a Chevy Tahoe. 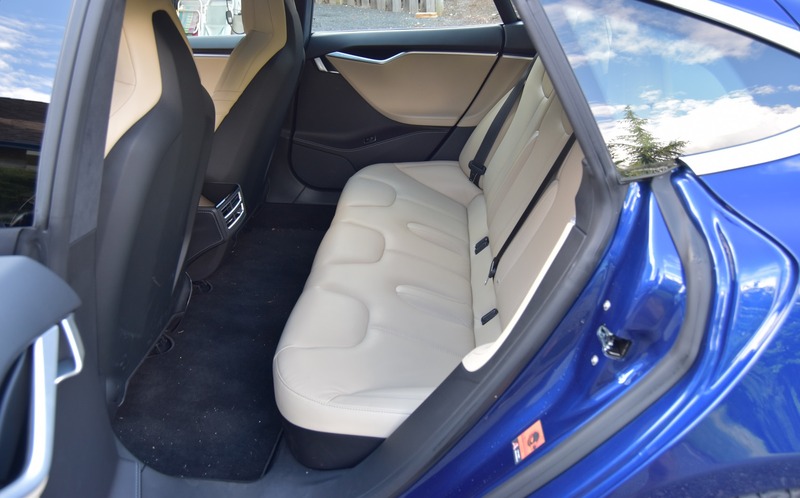 There’s tons of leg and shoulder room in the back seat, it’s got a huge amount of storage space under the hatchback (including a bonus in-floor well to really hide stuff from sight), and there’s a front trunk (called a frunk) to carry even more stuff. Although the Model S is a large and heavy car, it accelerates as if it were an ultralight high-powered sports car—mine goes from 0 to 60 in 4.2 seconds. It’s also handles like a much smaller car, thanks to its low center of gravity due to the batteries being mounted in the bottom of the car. The only time it really feels like a big car is when I’m trying to park it in a small lot somewhere. With all-wheel drive, it’s capable of handling slippery streets—though with minimal ground clearance, you really don’t want to take it on an unplowed snow-covered road. Obviously, the Model S uses no gas, thereby bypassing Oregon’s idiotic “can’t pump your own gas” law, which leads to slow fill-ups and aggravation every time I need gas. Thankfully, there’s no law (yet?) that requires I hire a helper to plug my car in at home at night. There’s no getting around it—the Model S is an expensive car, costing anywhere from $75,750 (Long Range) to $89,750 (Performance). You can add to that with options, though there aren’t many (paint colors, wheels, interior color scheme, and two levels of autopilot). Considered against cars in its current competitive set—powerful, luxurious, and feature-laden cars—Tesla’s pricing is more competitive. The Audi A8 starts at $83,000, but is over $105,000 with options. The BMW 7 Series is similar: it starts at $83,650, but can cost over $113,000 with options. Same with the Lexus LS (starts at $75,000), and the Mercedes Benz S class (starts at $89,900). Compared with its competitors, then, Tesla’s pricing doesn’t seem quite so outrageous. And the Model S is outselling those cars—both in the USA, and now in Europe, too. Even though one of those other manufacturers’ higher-end cars are in the price range of the Model S, my wife and I never even considered one. To me, those cars are just more-expensive versions of similar vehicles from each manufacturer, with not all that much to distinguish them beyond high-end features and engine choices (and the price, of course). And having owned an Audi A4 as well as a Lexus IS350 in prior years, I would expect the maintenance bills to be quite high. 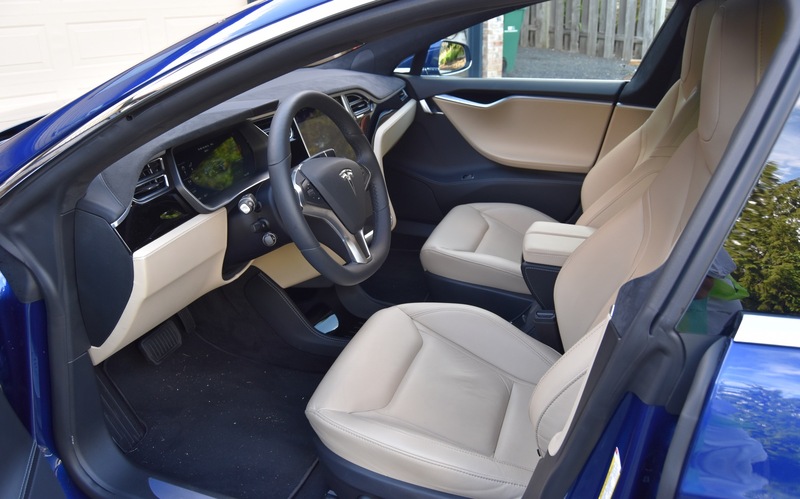 The Tesla represented a chance to drive something truly different, and it was a car that seemed to meet my diverse needs (more on those in a bit). Prior to the Tesla, the most expensive car we’d ever bought was actually a used 2008 Toyota Sequoia, which cost in the $40,000 range—so it was quite a jump to the Tesla. After crunching some numbers, and lots of discussion—we talked about it off and on for six months or so—we took some rainy-day money out of mutual funds that hadn’t done very well for an extended period of time, used that cash for the down payment, got a loan for the balance, and took delivery of our Tesla in June of 2016. I realize we’re incredibly fortunate to be able to afford this car. The good news is that Tesla’s plan to use sales of more-expensive cars to fund development of less-expensive cars appears to be working—you can now get an entry-level Model 3 (220 miles range, rear wheel drive, no autopilot) for $35,000, and a nicely-optioned long-range version in the mid-$50K range. 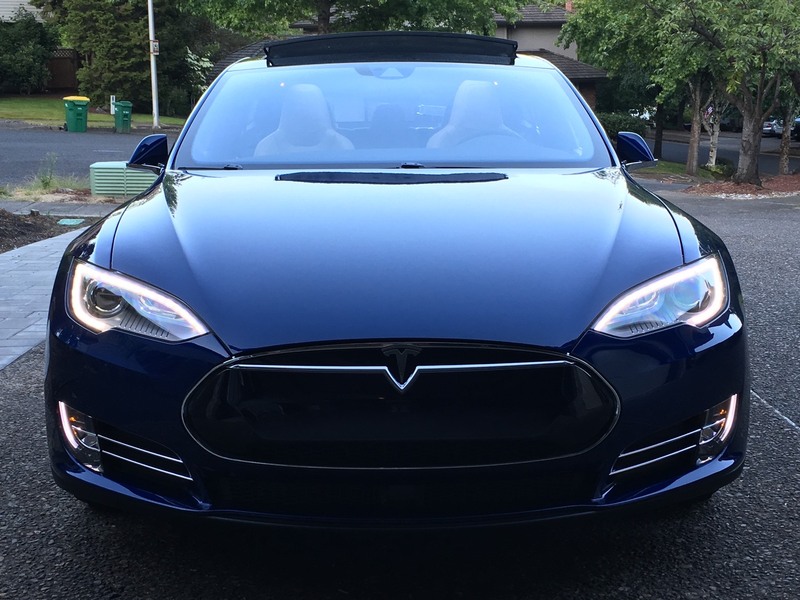 Buying our Tesla was a unique experience, unlike any other car transaction we’ve had—in ways both good and bad. On the good side, there is no dealer network as Tesla sells directly to consumers. As a result, there’s no haggling over pricing, no fighting over dealer-added services (“I know it’s Oregon, and we barely use road salt, but you need the Anti-Rust Gold Protection Package!”), and no need to visit six competing dealerships to see who has the particular car you want at the price you’re willing to pay. They somehow got my email address wrong, and yet never called to inquire as to why we weren’t replying to their emails. They made mistakes on our paperwork—not once but twice, including on pick-up day, which led to an extra hour or so while they re-did all the paperwork. Our sales rep, who was fantastic, wasn’t involved after we signed the purchase agreement—this differs from a traditional dealership, where the rep tends to stay involved until you’re at the very end of the process. I can’t say that our buying experience was great—it wasn’t awful, but the mistakes that were made were very trivial to avoid and left us feeling not overly confident about the company. At the time, Tesla lacked the financing resources of the major automakers (I think this is still true today, but I’m not positive), who tend to have their own credit departments. As such, at the time of our purchase, Tesla had partnered with a credit union to supply loans. As their rates were better than our own credit union’s rates, we went with them. But that meant we had to join the credit union, and deposit funds to keep our account open. Fast forward to today, and we’ve had nothing but good experiences with Tesla the company. They have a 1-800 number you can call for assistance; I’ve spoken to them a few times about questions I had, and they always had an answer and were pleasant to speak with. They have an email address where you can submit feature requests, bug reports, and ask questions (sounds like software, right?). I expect an answer when I submit a question, but I was surprised when I also received replies to some feature suggestions I sent in. We’ve had zero issues with our car, other than a couple of unexpected reboots of the large LCD panel when the car was new—this doesn’t affect driving in any way, and we haven’t had one in a year or so. Our car has been in for two annual services, both done in Tesla’s new Portland sales and service facility—a huge step up from the prior facility, which was located in a couple of suites in a business park! They now have a pleasant waiting area and free loaner cars if they need to keep the car for a day or more. I can’t speak to the car buying experience now, of course, but both in person and when I’ve spoken with Tesla reps on the phone since our purchase, I’ve had nothing but good experiences with the company. Looking forward to the rest of this series. We have an 11-year old Prius and my wife wants an electric. In fact she put in a deposit on a 3. But I’m not usually an early adopter and I don’t want the hassle on long trips and an extra hour to get the the ski resort. And I intensely dislike the lack of knobs for things like the radio and heater—I think the S is better than the 3. Also I didn’t trust that Tesla could support their cars. Hearing that parts are hard to get. And as of late, Elon Musk seems to be going off the rails. I expect you’ll probably cover most of these comments in the rest of your story. That said I’m more interested in the Audi. Yes it’s new, but Audi had made cars for years (even if they perpetuate fraud in Europe and in the US); but at least that’s leading to recharging stations. I don’t like SUVs either, but we haul stuff and almost no one makes a station wagon any more. The Prius is a bit small for our mountain bikes and camping gear on long trips. The S is definitely better than the 3 in terms of having an actual dash display, and a stalk for the wipers and one for autopilot. I don’t miss the radio controls at all, as the wheel-mounted ones work great (pretty sure those are in the 3, too.) And voice activation for music also works really well. We test drove a 3 (Performance), and while I loved the acceleration and handling, I missed the extra stalks and some sort of display in front of me—guess I’m old school that way. It does feel really open and airy, though. We went and saw the new Audi eTron, and it’s an impressive vehicle—very solid feeling in build quality, nice features, gorgeous high-res screen. The disappointment is the range on the US testing circut; only 204 miles from a 95kWh battery. My 90kWh Model S goes 293 miles on one charge. Even with numerous charging stations (which they don’t have yet), that’s going to make for very slow longer drives. I do talk about parts/service a bit, not much about Elon.